Look up in the sky! It's a bird! It's a plane! No, it's the black vote flying in to Alabama to once again save Democrats and thwart the dastardly plans of Donald Trump and his minions. In plain English the black vote helped defeat Roy Moore and make Doug Jones a U.S. Senator. If Democratic candidate Doug Jones lost to GOP candidate Roy Moore, weakened as he was by a sea of allegations of sexual assault and harassment, then some of the blame seemed likely to be placed on black turnout. But Jones won, according to the AP, and that script has been flipped on its head. Election day defied the narrative, and challenged traditional thinking about racial turnout in off-year elections and special elections. Precincts in the state’s “black belt,” the swathe of dark, fertile soil where the African American population is concentrated, reported long lines throughout the day, and as the night waned and red counties dominated by rural white voters continued to report disappointing results for Moore, votes surged in from urban areas and the black belt. By all accounts, black turnout exceeded expectations, perhaps even passing previous off-year results. Energy was not a problem. I previously noted that Alabama is one of the hardest states in the country to vote—especially so for black voters, and that voter suppression efforts could have had strong effects on black votes. Tuesday night’s returns are all the more remarkable because of the surge of turnout that appears to have taken place in spite of those very real barriers. The grassroots organizing in black communities by groups like local NAACP chapters was more muscular than it had even been in the 2016 general election. In the lead-up to Tuesday’s contest, voting-rights groups registered people with felonies, targeted awareness campaigns at people who might not have had proper ID, and focused specifically on knocking down the structures in place that keep black voters away from the polls. Their efforts immediately become a case study in how to do so in a region that has, since the Supreme Court’s 2013 Shelby County v. Holder decision curtailing the 1965 Voting Rights Act, become a bastion of new voter-suppression laws, including new voter-ID laws. The prospects of those laws and efforts to circumvent them will be further tested in the 2018 elections. 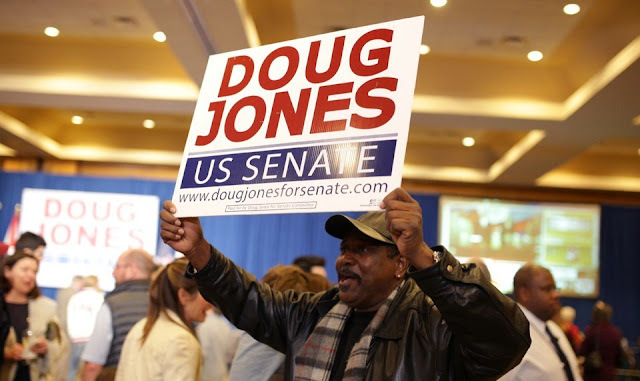 But, for now, Jones is the man in Alabama, and even as white voters by and large stuck with Moore, Democrats were saved by a community already fighting against the grain to be heard in the din of democracy.